“I WAS NEVER ALONE“ is a new play based on research with adults living with disabilities in contemporary Russia. The play draws directly from interview transcripts to create original character portraits woven together as a 90-minute play (a 7-12 minute monologue for each role). In English with some Russian words and phrases (not in dialect). OPEN AUDITIONS will be held 5:00-8:00pm, January 25th, 2018 in the Yale University Theatre Studies building at 220 York Street in New Haven (Audition space is wheelchair accessible). Please sign up for an audition time. Sides for the audition are available as a PDF here. For other formats, please email. Auditions for Yale undergraduate actors are conducted in tandem with YDC’s spring semester casting process. For actors in NYC, we will be happy to schedule a time to meet remotely (e.g. video chat). 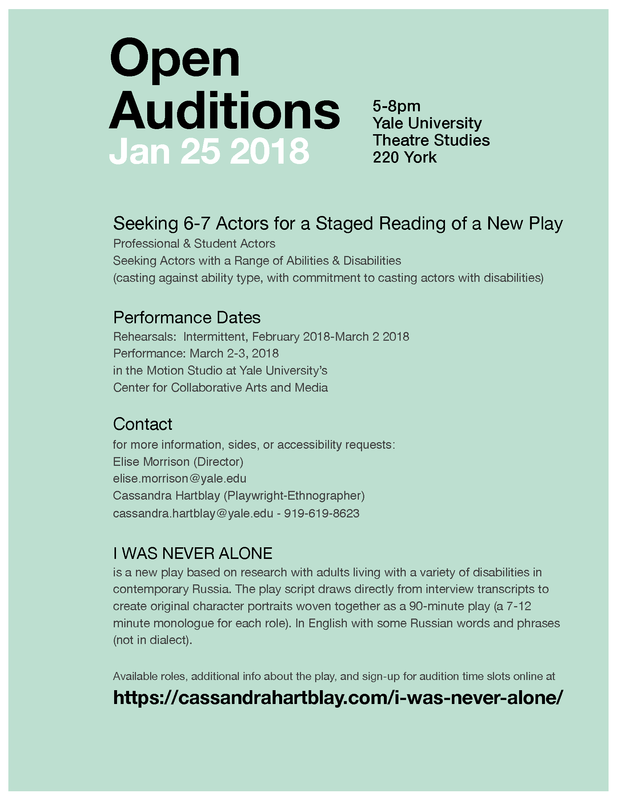 Because we hope to gather a cast that combines folks with a professional background in disability theatre and Yale undergraduate actors (especially those who self-identify with the disability community), we will be glad to work out a feasible rehearsal options, such as a rehearsal in NYC in February, and an all-cast rehearsal and tech the day of the reading. The play, I WAS NEVER ALONE will be presented in a staged reading on Friday, March 2, with the potential to add a second reading on Saturday, March 3rd (TBD once we have cast the show). Likewise, we will seek funding for actor stipends after casting the reading. We are happy to work with actors to facilitate feasible transportation depending on your specific needs (being picked up at the train station, etc), and actors coming from the city for the reading can anticipate at minimum reimbursement for MetroNorth train fare + transfer costs or equivalent. Sides and/or full script are available to share with interested potential collaborators – please email Cassandra (cassandra.hartblay@yale.edu). VERA – 31-year-old mom of two, high femme, paralyzed from the waist down, uses a manual wheelchair. Witty and social. Homemaker. SERGEI – 31-year-old with Cerebral Palsy that affects his gait. Shy, middle class. Enjoys singing, playing guitar, and war movies. ALINA – 31-year-old teacher from a working class family who can’t find work. Wheelchair-user with Cerebral Palsy that affects the muscle tone in her arms and legs. Sarcastic stand-up comedy fan. MAMA – 60-something mother to Alina. Retired school lunch lady. Opinionated, long-suffering. RUDAK – 40-something man. Local celebrity & lead singer and guitarist in a rock band. Manual wheelchair user following spinal injury in mid-adulthood. Creative, kind, and highly masculine. ANYA – 35-year-old woman. Busy professional psychologist with two jobs. Power wheelchair user with a degenerative muscular condition. Snarky and intellectual.